She got the surprise of her life — from the cops who saved it. 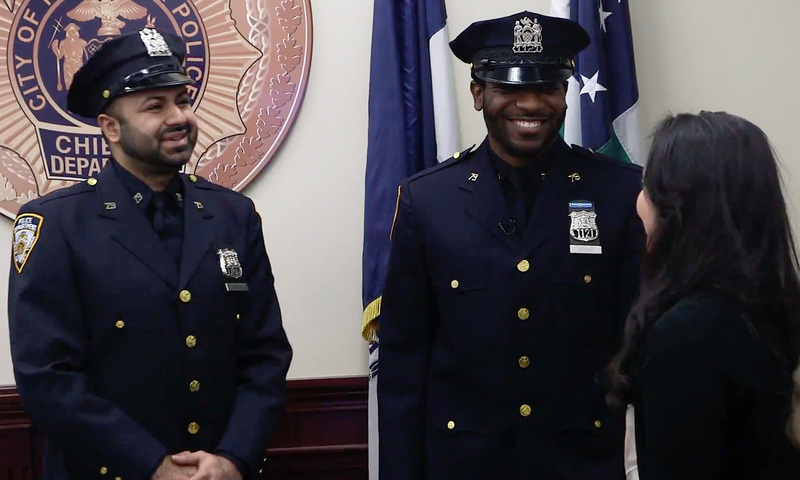 A binge-drinking Brooklyn woman who turned her life around after two kind-hearted officers found her blackout drunk was brought to tears Tuesday when the NYPD organized a surprise reunion with her heroes. Johnelle Mays, 27, told The Post in December how she was inspired to get sober on Christmas Day 2017, when two officers from the 79th Precinct showed her compassion and helped her home — rather than throwing her in the drunk tank — after she relapsed and went on a bender in Bed-Stuy. When the NYPD heard her story, she was invited to 1 Police Plaza on Tuesday for what she thought would be a meeting with Chief of Department Terence Monahan and 79th Precinct Commanding Officer Charles Minch to try and track down the officers. But after recounting her incredible tale to the two top cops, they surprised Mays by bringing Officers Christopher Bowie and Adnan Chatha into the room right then and there. “Oh, my God, no way!” Mays exclaimed as Bowie and Chatha walked in. She hugged the two officers and thanked them for treating her so kindly last Christmas: “I’m sure it wasn’t a lot of fun,” she told them. Chatha, who also teared up at the reunion, said he didn’t even recognize Mays, who has lost 38 pounds since quitting booze. “Very few times do you get to see people changing their lives, saying thank you,” said Chatha. The officers were also able to fill in some of the blanks on what happened that fateful night. Although Mays originally believed she’d been found face-down on the sidewalk, they said they actually found her inside a bodega talking to the owner. “We can tell that she was upset, a little inebriated, and a little upset, a little disoriented. We just wanted to make sure that she was safe, make sure she was alright,” recounted Officer Bowie. She mentioned she had a boyfriend, so the cops called him and put Mays on the line, helping to calm her down. “Instead of going to the hospital and through that whole process, she lived about four blocks away. So we decided to walk her home,” explained Bowie. Mays, who says she began drinking in high school and was “extremely advanced” alcoholic by her early 20s, said that simple gesture inspired a “turning point” in her life. “There’s a lot of shame involved with [the drunk tank]. That can actually lead the person to going further in depth into their addiction because they become so shameful and so depressed about that state of being,” she said. Chatha said he was “shocked’ to pick up a newspaper a year later and read about her transformation.